Bull Creek, Perth WA 6149. 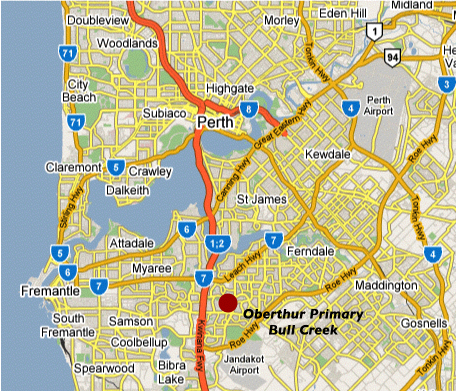 Take the Kwinana Freeway south for 10km, taking the exit for Leach Highway, and turn left (east). Follow Leach Highway for 1.5km then turn right (south) onto Karel Ave. 500m down Karel Ave, turn right (west) onto Parry Ave, then immediately left (south) onto Nicholls Crescent. Oberthur Primary is 100m along on the left. For an enlargement showing our local streets, see our Zone Map.